Upbeat acoustic music full of world music influences with an open invitation to sing and clap along. 5. What Do We Need for Shabbat? 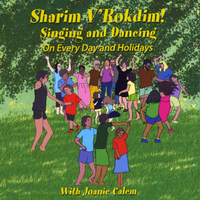 “Sharim V’Rokdim” is a collection of new songs and two traditional folk songs for the Jewish year. Some songs are “everyday songs,” which were inspired by the reminders that we glean from our Jewish heritage, such as being thankful for what we have, and working to make the world a better place for everyone. Some songs are new ways to explore the annual cycle of our wonderful holidays whose values help us focus to constantly grow to be better people. Every day of the year, holiday or not, we can sing and dance along to these songs! Each song has been audience-tested with both children and adults, and only the biggest crowd-pleasers made it onto the CD! Joanie Calem is a singer/songwriter, performer, storyteller and music teacher for audiences of all ages. Fluent in Hebrew and English, she also loves to sing and explore Yiddish and Ladino, and the songs, stories, and dances of Jewish culture, with its rich, multi-faceted treasures. Joanie is joined vocally on this CD by the Little Minyan Makhela from Columbus, OH, and by five wonderful piano students who also love to sing. Many thanks to Tom Boyer of GBS Studios for recording, accompanying, singing, and helping to create wonderful musical tapestries (and for the chocolate!). Thank you to Arkadiy Gips for sharing his amazing violin playing on this CD. Thank you to Phil Maneri for his wonderful bass work. And thank you to Jane Van Voorhiss for her beautiful cello additions. Hop Meine Homentaschen and Elimelech of Gilhoffen.